It is with great pleasure that John Alan have been appointed the sole agents in the sale of this ever popular 1930's three bedroomed terraced house offered with immediate vacant possession. Among the many benefits to mention: gas fired central heating, quality double glazing, fitted kitchen, quality bathroom, detached garage, excellent décor. The property is situated in a very quiet residential road with elevated views which make it an ideal family home. Entrance: Via double glazed porch leading to double glazed front entrance door, wood tiled flooring, school radiator, under stairs cupboard, further cupboard housing electric meter. Lounge: 15'1 x 12'2 Double glazed windows to front, wood flooring, tiled fireplace with open fire, coved ceiling, shelving to recess, school radiator, power points. Kitchen/Diner: 22'6 x 18'0 Double glazed door and window, quality matching wall, base and larder cupboards in cream gloss with inset sink unit, mixer taps, integrated Bosch washing machine and Hotpoint dishwasher, wood tiled flooring, island with Leger five ring gas hob, Electrolux extractor hood, two school radiators, housing for Ideal combi boiler. Diner: Double glazed sliding patio doors plus double glazed windows to side, Velux window, wood tiled flooring. Landing: Fitted carpet to stairs and landing, access to loft which we understand is insulated, school radiator, power points, airing cupboard. Bedroom 1: 13'2 x 11'2 Double glazed window to front, fitted carpet, radiator, built-in wardrobes. Bedroom 2: 11'10 x 11'1 Double glazed window to rear, fitted carpet, radiator, power points. Bedroom 3: 9'10 x 6'7 Double glazed window to front, fitted carpet, radiator, power points. Bathroom: Opaque double glazed window to rear, modern white suite comprising panel bath with mixer taps and shower attachment, waterfall shower head, partly tiled, tiled flooring, heat rail, pedestal wash hand basin, low level WC. Garden: Approx. 60'0. South facing, lovely paved patio, mainly laid to lawn with flower borders, further patio area to rear. Garage: Detached pre-cast construction with rear access via up and over door, with power. 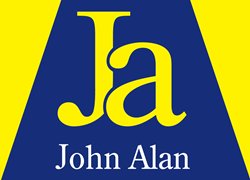 Viewing: Strictly by appointment with John Alan Estate Agents.